fi•du•ci•ar•y: A financial advisor held to a Fiduciary Standard occupies a position of special trust and confidence when working with a client. As a Fiduciary, the financial advisor is required to act with undivided loyalty to the client. This includes disclosure of how the financial advisor is to be compensated and any corresponding conflicts of interest. 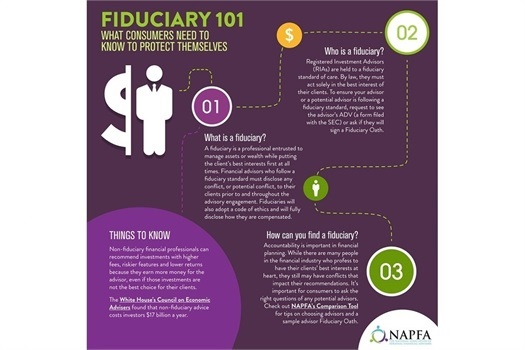 NAPFA firmly believes this is the strongest definition of Fiduciary available because of the basic requirements of Trust, Loyalty and Disclosure. Learn more about NAPFA. Someone who does not completely trust their financial advisor can never be fully confident that they are receiving the best-possible advice from the best-possible advisor. Without trust, can confidence really be achieved? An advisor who is loyal to only their clients will not be swayed by outside forces to recommend investments with higher commissions or payouts. Without loyalty, can people ever be sure their own interests are being looked after? People must know, and understand, how their financial advisor is being compensated for the advice they are providing and whether or not any conflicts exist that may cause a problem with that advisor’s ability to provide truly independent advice. Without disclosure, can prudent advice be provided? Contact us today so we can start working for you.